Any plants which don't fit into any other category are found right here! They are not required to "level-up" but they can be grown for fun whenever you have a spare pot in your Garden! Each seed produces one of several different fruits, some rarer than others. You can try to grow the full set in your own Garden, or just have fun trying to spot them out in other Gardens! Fairytale seeds can only be planted in Fairytale pots (which are available in the Pot Shoppe). Another 3 square feet of rainforest will be protected! Note: it used to be dropped by every 10th Albino spotted in someone else's Gardens. Another 2 square feet of rainforest will be protected! Dare you plant the halloween trick or treat flower? When fully grown, a beautiful flower will bloom, but when ready for harvest, will it be a trick or a treat? Dropped by every 10th ghostly critter in Fairyland, this plant does magical tricks to your garden! 1. Congratulations - you and your fairy have successfully harvested a Halloween Treat, which has given you an extra 50 Gold! Another 3 square feet of rainforest have also been adopted by this Garden! Harvest message Congratulations - you and Fawn have successfully harvested a Bobby Banana/Lucy Lime/Oscar Orange/Anna Apple/Simon Strawberry/Gordon Grape/Percy Pineapple which is added to your basket of Collectable fruits! Another 2 square feet of rainforest have also been adopted by this Garden! This plant is available 1 week before your Fairy's Birthday which is determined by the day you first added Fairyland application to your Facebook account. To find out your Fairy's Birthday, go to your Fairyland profile page. 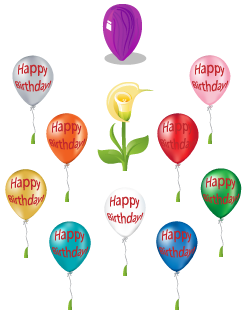 The Birthday Plant is available only once per year for each fairy.